This year's TrailBlazer is being hosted by the Friends of the Kal-Haven Trail and the Friends of the Kalamazoo River Valley Trailway. The mission of these groups is to provide support for expansion and maintenance of the Trails and continued programming, thereby attracting more people to take advantage of this regional resource. The Kalamazoo River Valley Trail is the newest Kalamazoo County Park! 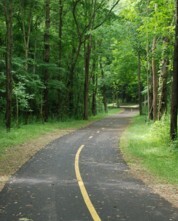 The trail is free to use and has a paved-asphalt surface that is 10-feet wide. 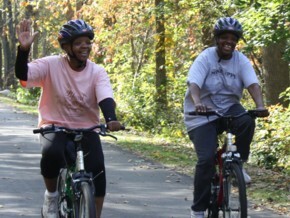 It's a multi-purpose trail for non-motorized transportation and recreation. 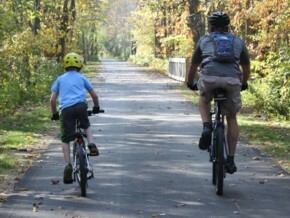 The Kalamazoo River Valley Trail will encompass 35 miles of trail throughout Kalamazoo County. Kalamazoo will be a regional hub, connecting Battle Creek to Lake Michigan, D Avenue to Portage, Augusta to Gull Lake, and eventually Lake Michigan to Lake Huron. 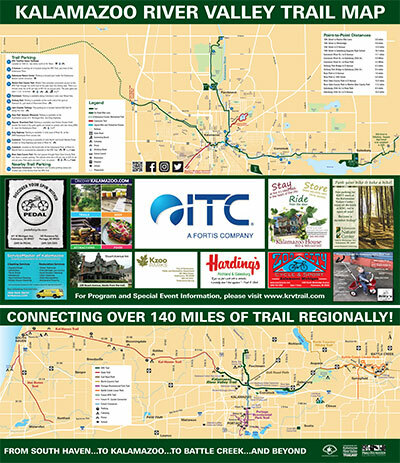 This existing trail and planned trails in other counties will connect more than 140 miles of trails-connecting together the Battle Creek Linear Park, the Kal-Haven Trail, and the Portage Bicentennial Park Trail. Currently, there are 22 miles complete of this non-motorized, paved-asphalt trail. One stretch begins at 10th Street, heading east from the Kal-Haven Caboose and stretching 4.8 miles to Westnedge Ave. You can also enjoy a section that connects 35th St. in Galesburg to D Avenue, traveling through River Oaks County Park, Mayors' Riverfront Park, Verburg Park, along Riverview Dr., and heading north along Markin Glen County Park and the Kalamazoo Nature Center. These two segments are connected by a signed-route throughout downtown Kalamazoo, featuring the Arcadia Creek Festival Place as well as many places to eat and shop. As funds and property become available the trail will continue to grow, realizing a vision that has been in the works since 1991. Operated as a Kalamazoo County Park, the KRV Trail is free to use and offers something for everyone. Whether you're looking for a relaxing family stroll, a journey into nature, an extensive workout or a bike route to work-the KRV Trail awaits your visit. 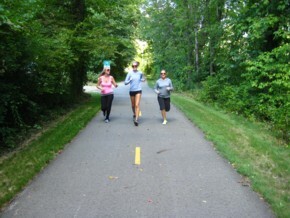 Receive your own sign on the Kalamazoo River Valley Trail by becoming a Friend today! Would you like to have your own sign on the trail? 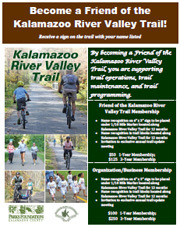 Become a Friend of the Kalamazoo River Valley Trail! Introducing our new, annual membership program. By becoming a Friend of the Kalamazoo River Valley Trail, you are supporting trail operations, trail maintenance, and trail programming. An annual membership of $50 includes a personalized sign along the trail. Click here to see the flyer for complete details, or click here to process your registration and payment online. 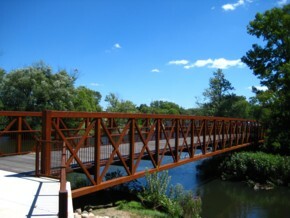 The Kalamazoo River Valley Trail map/brochure has recently been revised and the updated map includes the newest completed section that connects River Street in Comstock to 35th St. in Galesburg. If you'd like a copy of the brochure mailed to you, or a stack for your business, please call 269.383.8778 or email KRVT. The maps are available online as well by visiting this page. A Few Safety Reminders to make your experience more enjoyable. The Trail is open daily from 7:00 a.m. to sunset. Follow all County Park Trail Rules posted along the trail. Obey all trail and traffic signs. Cyclists and skaters must yield to pedestrians. Keep right and pass on left. Give audible warning before passing. There is safety in numbers. Use the buddy-system and enjoy the trail with a companion. Pets must be on a leash no more than six feet long and owners must clean up after their pets. Click here for a full list of the trail rules.